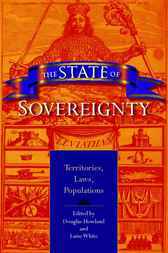 The State of Sovereignty examines how it came to pass that the nation-state became the prevailing form of governance in the world today. Spanning the 19th and 20th centuries and addressing colonization and decolonization around the globe, these essays argue that sovereignty is a set of historically contingent practices, and not something that accrues naturally to states. The contributors explore the different ways in which sovereign political forms have been defined and have defined themselves, placing recent debates about nations and national identity within a broader history of sovereignty, territory, and legality.